Ok, I'm laughing really hard! 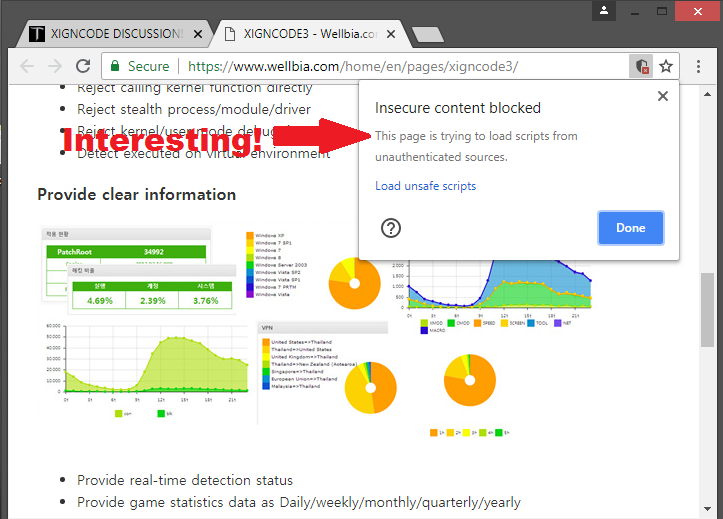 GOOGLE KNOWS WELLBIA/XIGNCODE IS MALWARE! Could you not spread misinformation? Google Chrome will list a website as containing 'Insecure Content' simply because not every single interaction on the website (including calling from within the same website) isn't secured with https://. As such, the content that is causing the issue is a stylesheet calling forward the Open Sans font from the website. Literally has nothing to do with Malware. Stop your insane blabbering. If you looked one step deeper, you'd see the "unauthenticated source" it's trying to load is... a Google Font. It's a rookie mistake, sure, but the same thing was happening on these very forums for many months until they finally fixed it. This has absolutely, literally, nothing to do with malware at all. Yes, I know. Such an idea with how more than 3/4 of the community views EME sounds crazy, but they really do have standards. Call it [filtered]-kissing if you want, but it'd be a stretch, since I also have constantly voiced my disagreement with EME's decisions in the past, but I do give an effort to be constructive, unlike half the people who just [filtered] on them rather than be constructive in their feedback. XIGNCODE hates....AND A GM MENTIONED IT! No, it doesn't. They're just listing off a long list of things that could possibly (but not necessarily) cause conflicts in an attempt to isolate possible causes. I use at least a third of the items listed on that list and have played BnS, BDO, and TERA that all use XIGNCODE with no problem. You're just spreading ill-informed paranoia, and it is causing this thread to be taken less seriously than it ought to be by the powers that be. This kind of fear-mongering will not, in any way, increase the chances that EME change their minds. BUT IT WAS LINKED TO WELLBIA/XIGNCODE FILES IN THE BSOD! OMG! Counterpoint, where is your head? No kidding. XIGNCODE (at least the old version) installs a system driver. When a system driver has some sort of problem, it can result in a BSOD, just like any other system driver that has some sort of conflict or problem. All you're saying is that, in at least one or more circumstances, the driver has triggered a kernel panic. But there's in no way enough information to know the actual root cause, and what chain of events caused the panic. The fact that XIGNCODE files are in the BSOD just mean that, yes, in fact, it's a system driver. I've said forever that the software is not fit for purpose because it's clearly ineffectual, but these arguments are just not going to work. A support employee is diferent than a GM stand for. I thought you will quote Seandynamite, CobaltDragon or KitTeaCup. I think we're missing the bigger point here. It doesn't matter if it was a GM or support. They're both representatives of EME. In your day to day business whether you work for yourself or you work for another company you'd never tell a customer to get lost which is essentially what was said in the quoted link. Then they go one step further and offer to delete your data. That sounds a bit rational and I wonder what exactly was said to them in the first place for them to respond that aggressively. Regardless, with that response from EME it's very obvious they want to kill Tera off now. stop twisting what the eme staff said where in the response he/she said get lost come on he if you do not wish to use see why people does get kill for a simple twist of words and a guy gets killed lawd these little children still bickering for somn that will not be removed and yet still they playing tera well go to better games that coming just send your stuff to me message me your info my bank has space. It was a GM cherub ,,,,not going to name names etc as that would be unfair however 'bread' and dragony like they sounded....oops i redacted the name as i dont think its eme's fault and they are left dealing with the [filtered].